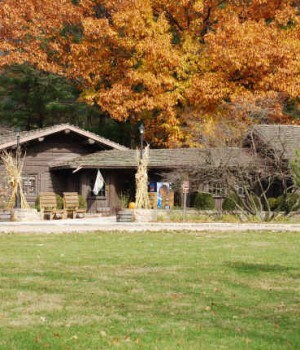 Lake LaDonna is located in the heart of one of Illinois’s largest tourism areas, offering tent and RV camping sites, as well as cabins and seasonal camping sites. The park has beautiful, giant oak trees providing an abundance of shade and two natural streams running through the camp sites. Lake LaDonna’s family friendly size means that your campsite or cabin is within walking distance of any section of the park. Our air-conditioned Deluxe cabins feature a kitchen with a stove top & oven, full-size refrigerator, sink and a full size bathroom with your own shower. All of our cabins (Deluxe and Pioneer) accommodate six people comfortably, with two sets of bunk beds and a Futon that folds down into a queen-size bed. To learn more about Lake LaDonna, visit their website.